Just three ingredients makes a delightfully creamy condiment for Mexican food or sandwiches. Simply combine crème fraîche or sour cream with freshly squeezed lime juice and salt. That's it! Crème fraîche and sour cream can be used interchangeably. Some people prefer the tanginess of sour cream, while others like the richness of crème fraîche. Sour cream has a fat content of about 20%, while crème fraîche has a fat content of about 30% and does not contain any added thickeners. Stir in a bit of lime zest for an extra burst of lime flavor or other spices like ground cumin or cayenne pepper. You will soon find yourself keeping this condiment on hand for various uses! Try using this lime creme fraiche as a topper for tacos, tostadas, enchiladas, or burritos. 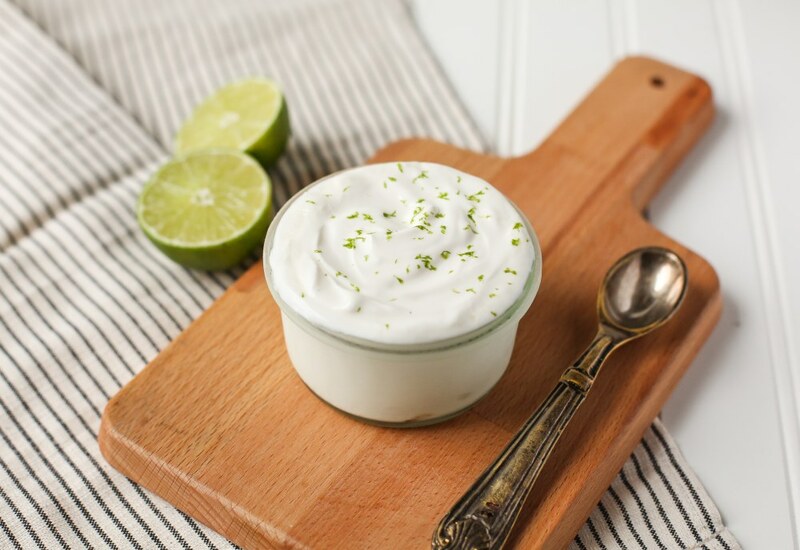 Add a couple of spoonfuls of honey instead of the salt and use this sweetened lime creme fraiche for desserts, like a topper for key lime pie, chocolate tart, or brownies. Or try stirring in other flavors like vanilla extract, cinnamon, or almond extract. The options are endless! Per Serving: 238 calories; 26g fat; 2.0g carbohydrates; 1g protein; 75mg cholesterol; 225mg sodium. Extremely simple, but elevates your next taco dish. I mean, just as a quick topping for your grilled chicken or a dip for spicy-grilled shrimp cocktail will easily be a nice snack. The yummiest addition to a taco or burrito. I actually used a 50/50 combo of sour cream and Greek yogurt to make it a bit more healthy. Delish!